Nail Mail! I'm not much of a nail lady but when Zoya had a get two free polishes promo early last month I couldn't pass it up. I had actually never used Zoya polish before but I had heard a lot of hype about them so I was intrigued enough to buy two more polishes to go along with the two free ones. The colors I picked up were Indigo, Charlize, Phoebe and Loredana. Two of the shades are matte which I've been dying to try since it started to become more popular. 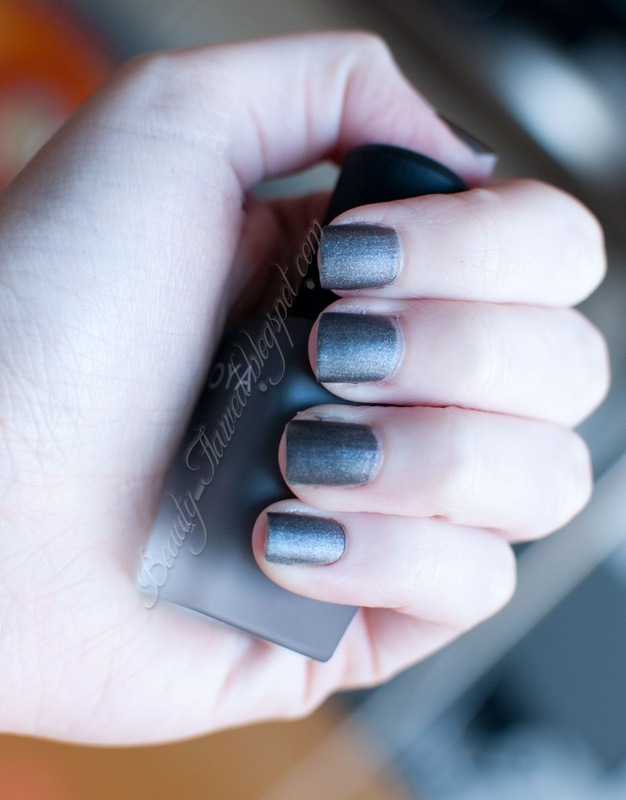 So today I bring you Loredana Matte Polish! Its really pretty and applied its this slate grey with silver sheen I guess you would explain it as. It reminds me of a gunmetal color and is just really intense on its not too dark but its just dark enough to give it some mystery with that great silver touch to it. The formula on this is really nice too it wasn't streaky and it only took 2 coats . It dried really quick as well which is great for someone like me who can't sit still for too long. ! As far as its matte qualities I think it looks great but I was expecting it to be a bit more well dull I guess but I'm quite happy with they way it turned out. All Zoya polishes are Vegan friendly, formaldehyde, dibutyl phthalate (DBP), toluene & camphor free. The other will be coming up in future posts hope you guys like this and sorry for the wonky photo layout blogger is not being nice to me today. Do you have any Zoya Polishes? Gorgeous colors. Zoya is a good brand. I love love Zoya's Matte polishes! I'm starting to too I'm pretty impressed with this one. I sure will! Love your cupcake logo on it very creative! Oooh I love that shade!!! I must seek out these matte polishes! You must they are awesome! Zoya is easily my favorite brand of polish. I blog about it all the time! They are so far I have to say Loredana is my fave!